I am beginning to notice more people sitting in the waiting room at my doctor’s office. After all, it is flu season. The flu outbreak strikes as early as October and will often last until May. It is impossible to know what the flu season will be like each year. According to the Centers for Disease Control and Prevention (CDC), anywhere from five percent to 20% of Americans get the flu every year and there are over 200,000 people hospitalized from flu-like complications. The CDC also estimates there are between 3,000 and 49,000 flu-related deaths every year. There is nothing more unpredictable than the flu virus. For starters, it’s quite easy to confuse flu symptoms with a terrible cold. The flu, or influenza, is an upper respiratory tract viral infection that will come along suddenly and it is more severe than a cold. Cold symptoms mainly affect the head, neck, and chest, but the flu will attack the entire body. Flu sufferers can pass on the virus a day before symptoms first appear and about five to 10 days after the onset of symptoms. The flu is spread through coughing and sneezing. You can get the flu virus from breathing it in, kissing, or handling anything, such as TV remotes, telephones, doorknobs, or computer keyboards. The flu virus then enters the body when your hands touch your mouth, eyes, and nose. There are three main influenza virus classifications that are thought to cause the flu, including type A, type B, and type C. The type A and B viruses are known to cause the large flu season outbreaks, while type C will often only cause mild respiratory symptoms. Other symptoms that may accompany the flu include insomnia, depression, sneezing, a runny nose, vomiting, nausea, and swollen glands in the neck. How do I Naturally Build My Immune System? I don’t known what’s more contagious—the flu or fear of the flu season. Every year, we are all told to get the flu shot. On the other hand, last year’s flu shot didn’t work that well. It is important to note that influenza viruses are constantly mutating. Their structures change slightly so it is difficult to build immunity to the flu virus. Scientists do their best every year to design a flu vaccine that best matches the flu virus that spreads throughout the community. The problem is the vaccine doesn’t always best match the flu virus going around. In fact, the CDC estimates that the flu vaccine reduces the effectiveness of the influenza virus by only 18%. For many people, the flu is a temporary and unpleasant thing, but for others it can be more serious. For instance, people over 65-years-old are at risk of dying from flu-related pneumonia. It is recommended you contact your doctor immediately if you catch the flu, if you have a compromised immune system or a chronic chest condition, such as emphysema, asthma, and cardiovascular disease. Other complications from the flu include dehydration, sinus infections, ear infections, diabetes, muscle inflammation, central nervous system problems, myocarditis, and pericarditis. The best defense against influenza is to build up your immune system naturally. Natural ways to strengthen your immune system include vitamin C with bioflavonoids, vitamin A with carotenes, vitamin E, selenium, iron, zinc lozenges, and B vitamins, including folic acid, vitamin B6, and vitamin B12. It is also a good idea to consume a diet rich in whole and nutrient-dense foods such as vegetables, fruits, nuts, seeds, and beans. Regular exercise and relaxation is also essential to build the immune system. There are thought to be trillions of microorganisms living in the intestines and digestive tract. It compromises up to 90% of the immune system. Many substances destroy the good bacteria in your digestive tract, including antibiotic use, birth control pills, steroidal and hormonal drugs, heavy exposure to chlorine and fluoride, carbonated beverages, coffee, radiation, stress, pesticides, herbicides, fertilizers, additives, and preservatives. That being said, probiotics are good bacteria that can effectively boost your immune system, which can prevent and treat flu symptoms. In a study published in the British Journal of Nutrition earlier this year, University of Florida researchers found that probiotic supplementation, especially bifidobacteria, will decrease the incidence of the flu during the fall and winter months. The study included 581 students and found that there were significantly fewer flu infections over a six-week period. Students taking bifidobacteria also had less severe flus when they did get the virus. You can also obtain probiotics from foods such as kefir, kimchi, kombucha, miso, natto, tempeh, sauerkraut, and fermented vegetables. There is less exposure to the sun during the fall and winter months, and as a result people increase their likelihood of vitamin D deficiency. It is theorized that lack of sun exposure also increases the prevalence of the flu. Vitamin D is thought to activate the body’s immune defenses against the flu. Studies have also found that T-cell activation requires vitamin D in order to fight viruses like the flu. T-cells are a type of white blood cell that is essential for a healthy immune system. Other evidence suggests that vitamin D3 (cholecalciferol) prevents macrophages from releasing inflammatory chemokines and cytokines. In a study published in the American Journal of Clinical Nutrition in 2010, researchers suggested that vitamin D3 supplementation decreased the incidence of the seasonal influenza A virus, especially in schoolchildren. People between the ages of 19 to 50 are recommended 200 international units (IU) of vitamin D daily, while those aged 51 to 70 should get 400 IU each day. Older adults aged 70 and up should get 600 IU of vitamin D daily. It is recommended to keep vitamin D blood levels between 40 and 80 nanograms (ng) per milliliter (ml) throughout the year. 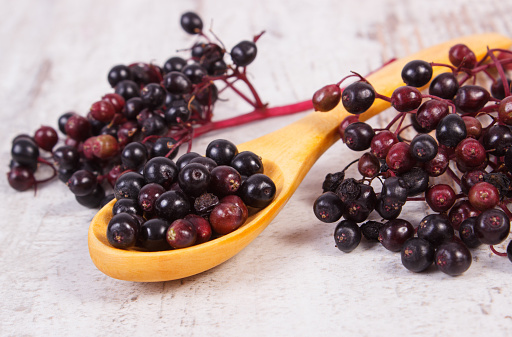 Elderberry has been one of the top natural remedies for flu and cold symptoms for centuries. The folk remedy contain antiviral and other properties that active the immune system by upping cytokine production. In 1995, elderberry juice treated the flu epidemic in Panama. It also contains immune-fighting nutrients such as vitamin A, vitamin B, vitamin C, flavonoids, and carotenoids. In a randomized, double-blind, placebo-controlled study published in the Journal of International Medical Research in 2004, elderberry extract proved to be an effective, safe, and cost-effective natural flu treatment. For the study, 60 Norwegian patents suffering from flu-like symptoms for 48 hours of less received 15 ml of elderberry or placebo syrup four times daily for a five-day period. Elderberry extract significantly reduced flu symptoms four days earlier compared to those receiving the placebo. Echinacea is another natural remedy that is extremely effective for cold and flu symptoms. It is known that echinacea root contains cytokine-modulating properties. Scientific evidence also supports the ability of echinacea to decrease the duration and severity of flu symptoms. A new study to be published in the upcoming December edition of the journal Current Therapeutic Research found that an echinacea drink product could produce fewer side effects than the antiviral drug Tamiflu (Oseltamivir), although both remedies were equally effective against flu symptoms. Studies have also found that echinacea supplementation is effective against the swine flue (H1N1) and the bird flu (avian flu—H5N1, H7N7). Oscillococcinum is a popular homeopathic product that is considered a go-to natural flu treatment at the first signs of the influenza virus. The remedy is made from wild duck heart and liver, which are areas known as reservoirs for the flu virus. A review published in the Cochrane Database of Systematic Reviews in 2012 found that oscillococcinum could reduce flu symptoms. Other homeopathic remedies often recommended for the flu include influenzinum, Anas barbariae, aconitum napellus, arsenicum album, belladonna, bryonia, eupatorium perfoliatum, ferrum phosphoricum, gelsemium, mercurius solubilis, mercurius vivus, nux vomica, rhus toxicodendron, and sulphur, dulcamara, and baptista. Taking a combination of these homeopathic remedies is also extremely helpful at the first sign of the flu. There are also other natural remedies to keep in mind when the flu hits. You should consider natural influenza treatments such as lomatium dissectum, pelargonium sidoides, and N-acetylcysteine. Other effective herbal remedies to treat the flu include oil of oregano, ginger, garlic, astragalus, thymus extract, angelica, balm, boneset, carline thistle, cayenne pepper, goldenseal, horseradish, lime, marjoram, mustard, myrrh, nasturtium, peppermint, yarrow, pleurisy root, white poplar, and American ginseng. Essential oils also used for the flu include frankincense, French basil, bergamot, caraway, coriander, eucalyptus, rosewood, and cinnamon leaf. How else can you naturally fight the flu? Be sure to avoid alcohol, processed sugar, and cut down on smoking. Also, stay at home, avoid contact with other people, keep warm and get lots of rest. Consume plenty of natural liquids such as homemade soups, bone broths, and herbal teas like chamomile or ginger. Mathie, R.T., et al., “Homeopathic Oscillococcinum for preventing and treating influenza and influenza-like illness,” Cochrane Database of Systematic Reviews, 2012; 12:CD001957, doi: 10.1002/14651858.CD001957.pub5. Siqueira, C.M., et al., “H3N2 homeopathic influenza virus solution modifies cellular and biochemical aspects of MDCK and J774G8 cell lines,” Homeopathy, 2013; 102(1): 31-40, doi: 10.1016/j.homp.2012.10.003. Langkamp-Henken, B., et al., “Bifidobacterium bifidum R0071 results in a greater proportion of healthy days and a lower percentage of academically stressed students reporting a day of cold/flu: a randomized, double-blind, placebo-controlled study,” British Journal of Nutrition, 2015; 113(3): 426-434, doi: http://dx.doi.org/10.1017/S0007114514003997. Urashima, M., et al., “Randomized trial of vitamin D supplementation to prevent seasonal influenza A in schoolchildren,” American Journal of Clinical Nutrition, 2000; 91(5): 1255-1260, doi: 10.3945/ajcn.2009.29094. Zakay-Rones, Z., et al., “Randomized study of the efficacy and safety of oral elderberry extract in the treatment of influenza A and B virus infections,” Journal of International Medical Research, 2004; 32(2): 132-140. Raus, K., et al., “Effect of an Echinacea-Based Hot Drink Versus Oseltamivir in Influenza Treatment: A Randomized, Double-Blind, Double-Dummy, Multicenter, Noninferiority Clinical Trial,” Current Therapeutic Research, 2015; 77: 66-72, doi: 10.1016/j.curtheres.2015.04.001. Adams, C., “Bifidobacteria Probiotics Fight Colds and Flu Infections – Page 2,” GreenMedInfo web site, September 30, 2015; http://www.greenmedinfo.com/blog/bifidobacteria-probiotics-fight-colds-and-flu-infections?page=2. Hershoff, A., N.D., Homeopathic Remedies: A Quick and Easy Guide to Common Disorders and Their Homeopathic Treatments (New York: Penguin Putnam Inc., 1999), 194-195. Balch, J., et al., Prescription for Natural Cures: A Self-Care Guide for Treating Health Problems with Natural Remedies Including Diet, Nutrition, Supplements, and Other Holistic Methods (Hoboken: John Wiley & Sons, Inc., 2004), 258-263. “What Causes the Flu?” WebMD web site; http://www.webmd.com/cold-and-flu/flu-guide/what-causes-flu-viruses, last accessed Oct. 22, 2015. Von Essen, M.R., et al., “Vitamin D controls T cell antigen receptor signaling and activation of human T cells,” Nature Immunology, 2010; 11(4): 344-349, doi: 10.1038/ni.1851. Burke, V., “5 Sure-Fire Ways to Beat the Flu,” GrennMedInfo web site, October 9, 2015; http://www.greenmedinfo.com/blog/5-sure-fire-ways-beat-flu-1. “What You Should Know for the 2015-2016 Influenza Season,” Centers for Disease Control and Prevention web site, last updated October 20, 2015; http://www.cdc.gov/flu/about/season/flu-season-2015-2016.htm. “Seasonal Influenza Q&A,” Centers for Disease Control and Prevention web site, last updated September 18, 2015; http://www.cdc.gov/flu/about/qa/disease.htm, last accessed October 23, 2015. Goodman, B., “Flu Vaccine Just 18% Effective This Year,” WebMD web site, February 26, 2015; http://www.webmd.com/cold-and-flu/news/20150226/flu-vaccine-effectiveness.